Though I have seen Dudley Senanayake speaking in meetings, my first face-to-face meeting with him took place in 1970. Given that it was immediately after United National Party’s crushing defeat at the general election, he was in a very sombre mood. As a group of student representatives from Ananda College we met him armed with a letter given by my father. It was Mr. Jinadasa Niyathapala, who was then the Secretary of the UNP’s youth wing, who paved the way for this meeting. His response to us is still fresh in my memory. The image of a political leader with unquestionable integrity who was never prepared to use students as pawns in the game of power politics was embedded in our minds. But his answer did little to dampen the enthusiasm for politics of a few ebullient youths. We did our best to convince him. After the lengthy submissions made by student representatives, he seemed to have understood the severity of the situation prevailed at the time. “OK then, let’s think over the matter. Please give me a week,” he said after a long pause. Exactly after one week, the student group from Ananda College received an invitation from Woodland House, the private residence of Senanayake. Our joy knew no bounds. Jinadasa Niyathapala, Professor Tilak Ratnakara, J.R.P. Suriyapperuma and Dr. Karunasena Kodituwakku were already there. The four gentlemen present were introduced to us. That was how the seeds were sown for the UNP’s student union, ‘Samavadi Shishya Peramuna’. It was this meeting that set the stage for my association with the late Hon. Dudley Senanayake, the epitome of gentlemanly politics of our country. The manner he conducted himself in public life makes him the quintessential democrat in Sri Lankan politics. He was a gem of a human being who bedecked and added value to political sphere with endless humanity. At a time human lives political power and wealth have got the better of humanity, many are the lessons, aspiring politicians can learn from the life of this gentleman politician that was Dudley Senanayake. Saddened and overwhelmed by a loss of life at the ‘Hartal’ of the early ’50s, he resigned honourably as Prime Minister and left Temple Trees for ‘Woodlands,’ his private residence displaying that arrogance of power was not part of his constitution. Through this act he unequivocally demonstrated that as the head of state he was responsible for the lives of his countrymen. “Politics is like a war. Sometimes you may have to use a poisonous gas,” Winston Churchill famously said. Dudley was a politician who never went to such extremes. He was a devout Buddhist which was in display in deeds rather than words. Dudley Senanayake never indulged in hate mongering and never used race, religion, caste or creed as a commodity to gain narrow political mileage. In a multi-ethnic multi-religious society, politicians who win the hearts and minds of all communities are a rarity. Dudley Senanayake was one such rare politician. I believe that he can be bracketed with politicians of the calibre of John Kennedy of America and Pierre Trudeau of Canada. As the general election of 1956 was drawing close, the United National Party led by Sir John Kotelawala sought to jump on the bandwagon and embraced the “Sinhala Only” policy, leading to a severe erosion of the party’s support base in the north. Nadesan who entered Parliament as a UNP member from Jaffna defeating Federal Party leader Chelvanayagam together with other senior Tamil UNP leaders in an emotionally charged speech told the Working Committee that they could no longer remain in the party in the wake of its decision to embrace ‘Sinhala Only’ policy. With this policy U-turn, the United National Party’s image as a national party amongst the people of the north suffered an irreversible damage. When Dudley Senanayake assumed leadership of the party, he did his best to remedy this historical mistake and mend fences with Tamil leaders like Chelvanayagam and Tiruchelvam. Though his Government tried to move several legislations to ensure justice to the Tamil people, the failure to seek their passage in the legislation in the face of unyielding opposition from extremist elements, the country lost a history opportunity to forge national unity. By denying the opportunity to the United National Party and the mainstream leftist parties to function as national parties common to all ethnicities of the country, racist parties tightened their stranglehold and the resultant damage to the country and the misfortunes it created is well documented in history from which we can learn lessons even today. In the aftermath of the failure of the Dudley Senanayake Government to get the District Council Bill which provided for the use of Tamil language for the people in the Tamil majority areas to transact their businesses with the Government, the Tamil leaders left the Government. I am reminded of what was told to me by a lobby correspondent of a leading English daily at the time. This correspondent met Amirthalingam, who was one of the Tamil leaders who left the Government and inquired from him about the possibility of Government being toppled as a result of their departure from the Government. “Dudley was a rare leader among Sinhala politicians. Though he failed to ensure justice to Tamil people due to stiff opposition from extremist forces, it is our duty to protect broadminded Sinhala politicians like him for the sake of future of this country. Therefore even though we left the Government, we will not allow the Dudley’s Government to be toppled,” was his reply. In a cruel twist of fate, those who hurled abusive and provocative slogans targeting Dudley Senanayake and gave leadership to the movement to defeat District Development Council Act have today started advocating the district units as the solution to this problem. Dudley Senanayake was a leader who made the saying “a politician thinks of the next election and a statesman of the next generation” truly meaningful as his all actions were aimed at the next generation. It is evident from the reports of the meetings of the State Council that Dudley Senanayake while serving as a member of the Council had expressed views against the motions moved by his father. Caught in a conflict between his respect for father and his own conscience, his angst was expressed in a letter he wrote to his father. This exchange of opinions between father and son sets an example to politicians of today as regards democratic conduct. When Dudley was elected to the premiership following the unfortunate demise of his loving father, he was reluctant to hold the post without a mandate from the people and as a true democrat he decided to dissolve Parliament in order to seek a fresh mandate from the people. After the electoral victory in 1965, he invited C.P. De Silva to accept the premiership as a token of gratitude for his pioneering role in toppling the leftist government in 1964 and this stands testimony to the kind of leader that Dudley Senanayake was. However C.P. declined the offer saying that “people were expecting his (Dudley’s) leadership”. The magnanimity of Dudley who was never greedy for power was unheard of local politics. During the tenure of Dudley Senanayake Government from 1965 to 1970, the country posted record performances in every major sphere. The achievements of agricultural sector under Minister M.D. Banda, industrial sector under Minister Philip Gunawardane, education sector under Minister I.M.R.A. Iriyagolla and financial sector under Minister U.B. Wanninayake were phenomenal, to say the least. Political leaders of Sinhala, Tamil and Muslim political streams were an integral part of the Dudley Senanayake Government formed in 1965. I.M.R.A. 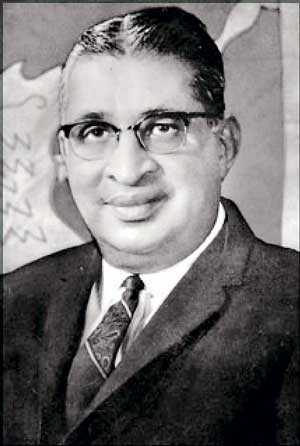 Iriyagolla who gave leadership to the Sinhala Bhasha Peramuna in the decade of 50, K.M.P. Rajaratne who led the Jathika Vimukthi Peramuna, Philip Gunawardane who was dubbed as the “father of Marxism in Sri Lanka,” Vijayananda Dahanayake, the political heavyweight from the south who once held the premiership and known for his vehemently anti-UNP stance, prominent Tamil politicians such as S.J.V. Chlevanayagam, G.G. Ponnambalam, Thiruchelvam and Amirthalingam remained loyal partners of that Dudley Senanayake Government from 1965-1970. Anyone who became a close ally of Dudley never parted ways with him as closer they got the more they understood his unmatched attributes and virtues. Irrespective of political loyalties and affiliations, the Sri Lankan populace adored Dudley, regarding him as one of their own. In the truest sense of the word, he was a people’s politician. May we have more Dudley Senanayakes in this country to make Sri Lanka a dignified nation.